The theme of Christ the King and the Kingship of Christ runs through the readings, collects and hymns tomorrow (26 November 2017). It was moving, then, to hear in yesterday [24 November 2017], during the USPG Birmingham Regional Day, Rebecca Woollgar, the USPG Volunteering Manager, about her experiences in the Anglican Parish of Christ the King in the ‘City of God’ outside Rio de Janeiro in Brazil. Rebecca is facilitating these regional days in a number of cities, and has already shared stories about the work of the Anglican mission agency USPG (United Society Partners in the Gospel) in Cardiff, Grantham, Manchester and Bristol, with more planned in the new year. I was present as a trustee of USPG, and the day in Birmingham involved people from the dioceses of Lichfield, Derby, Leicester, Southwell and Nottingham, Birmingham and Worcester, including former missionaries, staff, trustees, council members, and parish and diocesan volunteers and supporters. These days aims to build relationships, provide updates on new resources, share stories about world church partners, and help equip and inspire volunteers to spread the word about the work of USPG. This is a working example of USPG coming to the dioceses and parishes, and not just being London-based. Rebecca spoke of her ‘life-changing’ experiences in Brazil, including her visits to the Anglican Parish of Christ the King in the ‘City of God,’ Cidade de Deus, a neighbourhood of Rio de Janeiro, Brazil’s second largest city, and Belem in the Diocese of the Amazon. 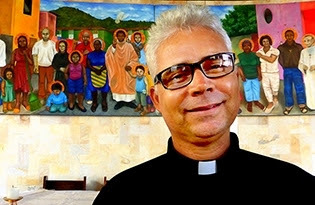 Father Antonio Terto works as the priest with a small congregation in an area that became internationally famous through the 2003 movie City of God that focused on the conflict between rival drugs gangs and the police. The community faces many challenges. In 2008, a major police operation clamped down on drug dealing, but in 2016 a new wave of crime and violence emerged that may be linked to government austerity measures, including the cutting of social services. It is estimated that only 3% of teenagers finish school, while is above 25%, and the average income per household is just £50 a month. Although Anglicans are in a tiny minority in Brazil, the church Anglicans are well regarded locally and something of a community hub. The Anglican congregation of Christ the King is small but growing and concerned to share God’s love, especially in these difficult times. computer training. USPG is supporting this work by funding Father Antonio Terto at Christ the King. The church's focus remains on reaching out to the poor and marginalised, and Rebecca described community and children’s activities, including sports, language lessons, literacy courses, computer training, meetings for Alcoholics and Narcotics Anonymous, counselling, dance classes, a second-hand clothes shop and a church café. USPG is also supporting a human rights and social action programme in the Diocese of Amazon, helping local communities to find a way out of exploitation and poverty. In recent decades, men have been lured to the Amazon with the promise of land, only to end up as slave labour. As well as plundering the Amazon of its natural resources, more and more forest is being destroyed to make room for beef cattle, highways, hydro-electric plants, and plantations of whatever product is in fashion around the world. Some call it development – but it is not development for the local people. There is also a global impact. The rainforest has been called the ‘lungs of the planet’ because it helps clean the air by removing carbon dioxide generated by cars, planes, power stations, and so on. Destroying the rainforest means more carbon in the atmosphere, which will increase global warming. The church – with funding from USPG – is running workshops entitled Social Agents and the Fight for Rights. We are training leaders to support local people in the Amazon. This will include education, better salaries, protection of the rainforest, and more. The Cathedral of Santa Maria, in Batista Campos, is developing a programme reaching out to the local elderly population, many of them lonely and suffering from depression. ● Improving Livelihoods, Southern Africa. In the afternoon, Victoria Howard spoke movingly of her work with Street Pastors and street people during her placement with USPG in the Seychelles. The USPG Advent appeal this year is presenting uplifting stories from world church partners and looking at how faith is inspiring practical action that is saving lives, such as the vital maternity care being provided by Anglican healthcare programmes around the world. The problems surrounding Climate Change are the priority for USPG in 2017/2018, and is being emphasised in seasonal resources, the winter edition of Transmission and the Prayer Diary. Anglican churches around the world are engaged in sustainable development under the heading of the 5 Ps: Prosperity, People, Planet, Peace and Partnership. The USPG resources available for churches and parishes on faith in a changing climate include a prayer meditation video based on the Lord’s Prayer. Future events include the ‘Rethinking Mission’ conference in Birmingham Cathedral on 17 March 2018, the annual conference in High Leigh on 2-4 July 2018, and the annual reunion at All Saints’ Church, Saint Margaret Street, London, on 15 September 2018.